OPPORTUNITY!!! Reduced Price For Limited Time On This Fantastic Townhouse with 2 independent apartments, set in a Resort in Praia da Luz, within walking distance to the beach. A beautiful townhouse enclosing two independent apartments, set in building that surrounds the communal swimming pools and a lovely Mediterranean garden, located in a Resort of Praia da Luz. The main property entrance opens to a private staircase that leads up and down to both accommodations, which have each an individual entrance locked main door as well. On the ground floor the accommodation is comprised by a living and dining area with a fully fitted kitchenette and balcony, 1 double bedroom with fitted wardrobe and 1 bathroom. The top floor contains the second apartment with the same area as the ground floor, comprising as well a living and dining area with a fully fitted kitchenette and balcony, 1 double bedroom with fitted wardrobe and 1 bathroom. This apartment as an extra built-in mezzanine, which gives the extra space for the second bedroom with a sitting area. Both apartments have independent direct access to the communal gardens and pools. The windows are double glazed with electric shutters. Included in the features are: video porter, underground electric heating system, heating and cooling conditioning system installed, central vacuum system and appliances for all the rooms. 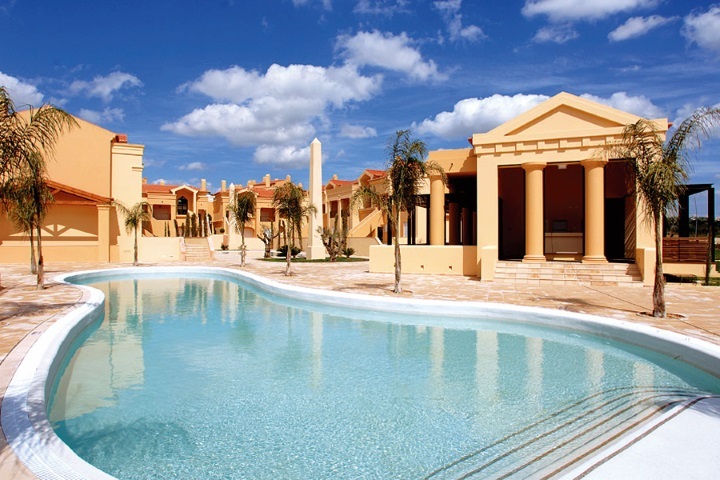 It is located in a Resort with reception, next to the beach in Praia da Luz with shared pools (family, children and adults only), tennis courts and children play area. This is a perfect investment for a holiday home with a huge potential as a rental income property.